Wow. 497 hot runners ran round Fairlands Valley Park in Fairlands Valley Spartans “Relays in the Park” on Thursday evening. Teams came from all around Hertfordshire and Bedfordshire. All runners ran 3K. Men’s teams consisted of five runners, women’s teams had three, and mixed teams consisted of two men and two women. This is an inter-club event and included the county championships. Not only did FVS organise the event and provide dozens of marshals but their mixed team of DANNY SUTTON (12:44); VERITY FISHER (13:49); CHRIS HOLLAND (12:48) and SUZY HAWKINS (12:18) were third. The Spartans fastest woman was ASHLEY SCHOENWETTER with 11:46 and SIMON JACKSON fastest man with 10:00 exactly. 39 Spartans ran. There were some amazing times from some of the visitors. LOTTIE ROWEDDER from Herts Phoenix finished in 10:46 and ALEX LEPERTE from Barnet and District came in with 8:50. There was a very tiring event for some in the heat with some saying they were dry by 1500 metres but enjoyable, a great atmosphere and fantastic for spectators who could see each leg several times by walking across the bridge between the top two lakes. Another Fairlands Valley Spartans success. Spartan STUART HAYCROFT took a massive 14 minutes off his personal best at the Lee Valley 10 mile race. He was first veteran in 64 minutes 36 seconds. 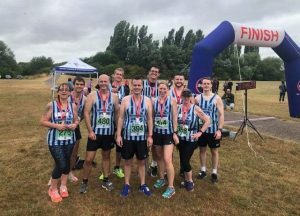 SALLY McBRIDE ran at the Lee Valley 10 Fest with 10 other Spartans on Sunday and managed to pick myself up a new non stop 10 mile personal best (PB) of 1:44:56 shaving off a huge 11 minutes 47 seconds of her previous 10 mile time. It was the longest distance she has run this year. She said the course is a beautiful place to run and even though the weather was a bit wet the temperature was just perfect and the event was well planned. SUSAN McANENY ran the 10 miles in 1:27:51 and was 19th female out of 96. She was sixth in her category. The other Spartans were JAMES KAY 1:12:10; TIM ROBINSON 1:25:16; LEE PICKERSGILL 1:26:47; SAM SIMMONS, 1:36:50; LINDA NOLAN 1:40:53; KAREN BROOM 1:43:53 and TREVOR BROOM 1:44:47. In the 10K event MONICA SMITHSON finished in 58 minutes 42 seconds. 31 degree temperatures defeated many runners but Spartans DAVID BOWKER and JIM BROWN completed a scorching Serpentine 5K on Friday lunch-time. David came in with 21 minutes 31 seconds and Jim with 24 minutes 40 seconds and third in his category. Jim is up to twelfth in the year long Last Friday of the Month series. Jim said the race was unique in that it was run in reverse direction to usual, it was seriously hot for the second kilometre of each of the two laps where there was no cover. The conditions contributed to there being only 169 finishers this month. Other Spartans helped at the finish of Ride London, rode Ride London or rode the Dunwich Dynamo, an amazing 188 kilometre cycle ride by about 3,000 people that started in Hackney at 8p.m. on Saturday evening and went through the night to get to Dunwich, on the Suffolk Coast, in time for breakfast. No rain and lots of moonlight helped to make the Dynamo enjoyable. BRIAN WHITE completed the Ride London 100 in a very wet 5:20:59 and CAROL PAUL came in at 7:23:04. The reduced temperatures of the last weekend in July saw 26 Fairland Valley Spartans’ head out to take part in the weekly Parkrun Events. Parkrun personal best (PB) times were achieved by ALISON SHELLEY at Stevenage in 25 mins and 52 secs and NEIL ROBINSON at Letchworth in 26 mins. While landmark runs took place at Stevenage for BARRY OSBORNE who ran his 40th event in 24 mins and 6 secs, CHRIS HOLLAND who finished for the 65th time in 27 mins and 47 secs, and DANNY SCANLON who completed the course 10th overall in his 95th run in 19 mins and 28 secs. Top 50 finishes saw THOMAS SAUKA and MARTIN DUDLEY complete the Stevenage event in 20 mins and 40 secs and 22 mins and 59 secs, respectively. Finishing the same course in under 30 mins, JONATHAN JONES ran in a time of 24 mins and 27 secs, KAREN PALMER in a time of 25 mins and 57 secs, MICHAEL O’KEEFE in 26 mins and 53 secs, DAVID SCOTT in 26 mins and 59 secs, and JENNY GARRET in 27 mins and 27 secs. Closely followed by CLAIRE EMMERSON in 27 mins and 28 secs, VERITY FISHER in 27 mins and 45 secs, JULIE SHADBOLT in 27 mins and 52 secs, PAUL HOLGATE in 28 mins and 47 secs, and CATHERINE CRAIG in 29 mins and 23 secs. Fewer than 40 mins was achieved by ROWENA RUTLEDGE, CALLEI CHAPMAN, SALLY PHILIPS, CLAIRE EMMERSON and HAZEL JONES in 30 mins and 17 secs, 30 mins and 31 secs, 30 mins and 39 secs, 24 mins and 6 secs, and 37 mins and 13 secs respectively. First time attendance at new events resulted in DARYL STEVENS finishing the Bicester event in 39 mins and 52 secs, and PAUL JENNINGS the Westmill event in 28 mins and 33 secs, who was joined by ANDY JAY in a time of 25 mins and 10 secs. TIM ROBINSON, the lone Spartan at the Ellenbrook Fields event, finished the course in 28 mins and 13 secs.